This article in the Indian Express today mentions a proposal for better identification of the Below Poverty Line (BPL) rural poor. The proposal suggests including classes like destitute, manual scavengers and primitive tribal groups while excluding those who own telephone landlines, refrigerators, two, three or four-wheelers, tractors, farmers with Rs.50,000 kisan credit limit, those with income of Rs.10,000/month and more. While discussions around accurate classification of BPL poor (whether urban or rural) are led by economists, sociologists and policy experts, marketers have also been discussing the need for an accurate scale that captures spending power (of various socioeconomic groups) and consumption trends. For instance, a leading marketer such as Rama Bijapurkar has mentioned here the need to calibrate the current SEC classification with respect to asset ownership. Socio Economic Classification (SEC) is a common parameter used by businesses to understand consumption potential in the Indian population. The urban SEC classification is a combination of education level and occupation of the chief wage earner of the household. 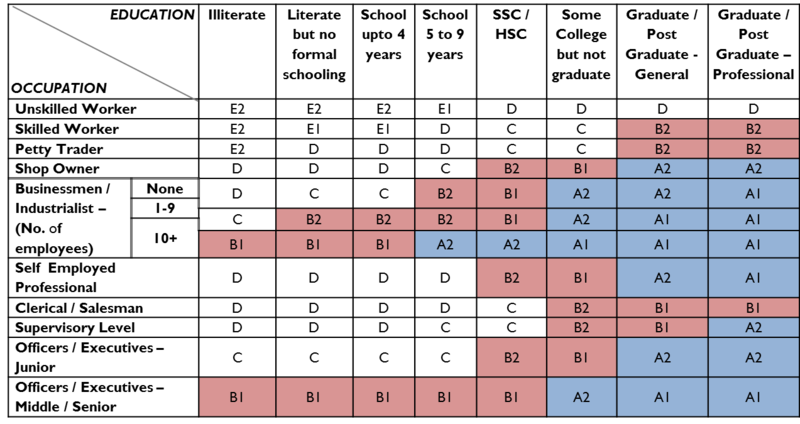 According to this system, the urban Indian households are split across SEC A1, A2, B1, B2, C, D, E1 and E2. Although this parameter is very commonly used, it has its drawbacks. One of the fundamental drawbacks is – since the classification is based on education and occupation level only, it misses out on the fact that income levels within an SEC can be quite disparate. The grid simply assumes that higher education and better occupation leads to higher income and thus higher consuming potential, but this may not always be the case. Take the case of a shop owner with only primary education (classified as SEC D) who may be earning more than a graduate junior executive (classified as SEC A2); therefore the shop owner may have the potential for higher consumption, despite being categorized into a much lower SEC. The chart below clearly illustrates how the standard SEC grid misses out on the fact that income levels within an SEC can be quite disparate. This is especially true of SEC A, and to a lesser extent, of SEC B. While there is a fairly large chunk of SEC A (34%) that earns less than Rs.3 lakh annually, the rest is composed of fairly thin slices of varying income levels. The richest slice, 16% of SEC A that earns over Rs.15 lakh per annum comprises of people of widely divergent income levels and very different purchasing power and consumption trends. Therefore, SEC is too simplistic a classification and cannot be used as a consumer segmentation variable on its own – it needs to be layered with additional defining criteria such as income, asset ownership, etc. Perhaps this classification did work when India was a uni-dimensional, mass market. But, with growing product offerings, new brands entering the market, more players in the market space, increased consumer involvement in decision making and higher aspirations and needs – the consumer has evolved, and so should the way of classifying him/ her. Entry filed under: Evolving India, India Stats, Marketing. Tags: consumer, demographic shift, segmentation variables, statistics. I believe in the US (not like it is some kind of gold standard by any means) they do layer income and wealth variables along with age and educational qualification. What is keeping companies/consulting firms in India from doing this? It’s not like the relevant statistical data is not available or that people are just plain dumb. Also, how would this model work when you factor in time – as people move from one segment to another as educational or income levels increase? How would you go about creating a more relevant and dynamic model? It would be interesting to see what the EV team might come up with. Looking forward to your inputs. Let me clarify that in India too, firms layer the SEC classification with income, asset ownership and other variables in order to come up with meaningful segments. But there is no standard classification that captures a reasonable amount of detail and that would mean the same across firms and institutions (either educational or policy related). The SEC classification is the only standard that is used across and means the same to everyone, but that, as we explained, is woefully inadequate. As for the time question, as people’s income increases or educational level changes, they would just move to a different consumption band over time. Depending on the trajectory and how fast they move from one segment to another, there may be smaller sub-segments that would behave differently and could be classified separately. for audio songs existing at this website is actually fabulous. Forr latest news you have to pay a visit world wide web andd oon intfernet I found this web site aas a finest web site for hottest updates. Thanks for the comments. Do keep visiting the blog. Glad you liked our blogpost, hope the ideas are useful to you. people’s attention? I mean Limitations of the SEC classification | is a little plain. You might peek at Yahoo’s front page and watch how they write news headlines to get people to open the links. We’re glad you found this useful, do keep visiting the blog.